DJ SLIPMATT (SL2/World of Rave)!!!!! New announcement – Slipmatt now joined by rave legend MC Chalkie White! Award winning, bonkers family fun with Big Fish Little Fish family rave as they return to High Wycombe after two sold out shows for a Circus themed party! Genre-hopping DJs are on the decks playing classic club tracks with bubbles, glowsticks, glitter, crafts, play, club visuals, giant balloons, legendary parachute dance, licensed bar and so much more! Fancy dress encouraged. 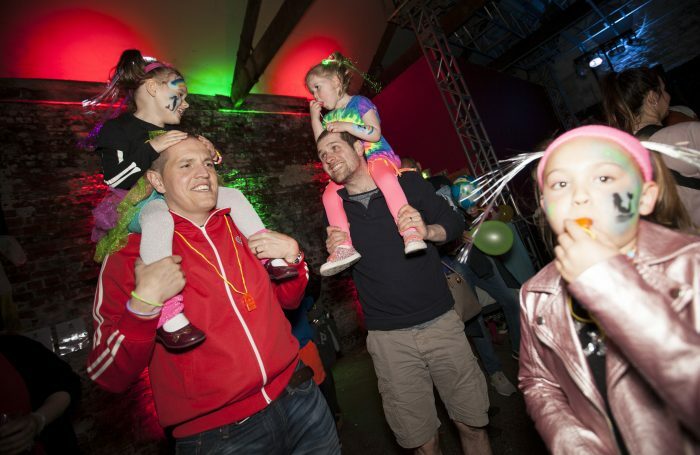 Roll up roll up – it’s the greatest family rave on earth!. Rave legend, Slipmatt DJs house/rave/techno/drum’n’bass/bass/garage/hip hop on the multi-sensory dancefloor with glitter cannons, bubbles, giant balloons and parachute dance. Captain Cookie Crafts tables with giant mural, themed crafts and playdoh table. Some light snacks available at venue. Facepainters our excellent facepainter will be on hand. Be transformed! With PHACE by Philly. Kids £5 – Adults £7 www.facebook.com/PHACEbyphilly. Children must be over 2. CASH ONLY. Please be aware that events are standing/dancing with limited seating, club lighting rigs (no strobes) are used and events are busy with 4-800 people at each party – which helps create the rave ambience. Each event is stewarded and risk assessed in advance. Music is monitoed and played at a safe level. Buggies must be left in buggy park and will not be allowed on the dance floor. The licensed bar will be open but no glass will be allowed in the event.